A couple of years ago I found that it was possible in an Exchange Server 2003 environment to change the display name that external users see on your email, to the Simple Display Name rather than the Display Name that appears in the GAL. Unfortunately this ‘feature’ went away in Exchange 2007, at least initially, it cam e back in a Service Pack update. SP 1 RU4 or later I believe but you should check to make sure. When I was working on my home setup, which uses Exchange 2010, I came across the Simple Display Name field again and it occurred to me to check to see if Exchange 2010 supported this capability. I did an Internet search and low and behold I found the steps required to turn this capability on, only they didn’t work! Not only did the steps not work but as I dug in to it I found the Microsoft documentation indicated it should work. My problem, it seems, is that while the Microsoft documentation said that the Set-RemoteDomain command supported the –UseSimpleDisplayName parameter my setup didn’t. Issuing a Get-Help Set-RemoteDomain didn’t show the UseSimpleDisplayName parameter. What’s going on? Then the light bulb went off. I checked my version of Exchange against the latest and yes mine was Exchange Server 2010 while the latest available was Exchange Server 2010 SP1. Unfortunately I didn’t take any screen shots of the PowerShell error that I got when I tried to implement the Set-RemoteDomain command but if you do a simple check to find out what Exchange build you have you can then determine if the command will work. 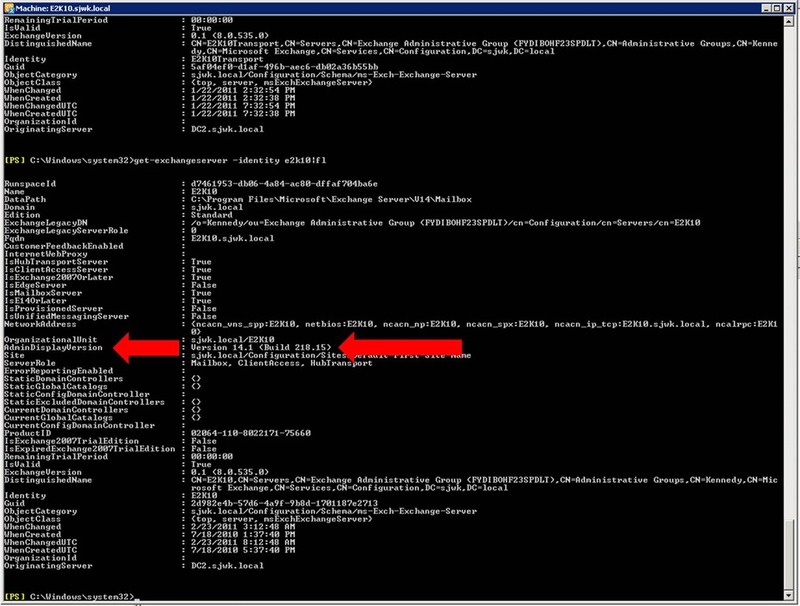 You can issue a Get-ExchangeServer –Identity <server> | FL command to identify the build. You can see the build number under AdminDisplayVersion, as shown in the screen shot below. Microsoft have a list of Exchange Server versions and associated build numbers. These can be viewed at; Build numbers and release dates for Exchange Server. For Exchange Server 2010 the build was 14.00.0639.021. For Exchange Server 2010 SP1 the build was 14.01.0218.015 which show up under AdminDisplayVersion as 14.0 (Build 639.21) and 14.1 (Build 218.15) respectively. You could also use the Get_Help Set-RemoteDomain command and see if the help shows the UseSimpleDisplayName parameter or not. 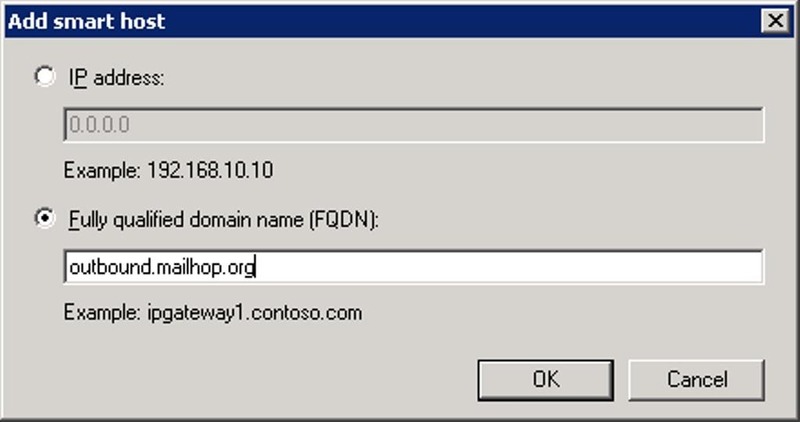 The screen shot below shows the result of the Get-Help Set-RemoteDomain command for Exchange 2010 SP1. Once I’d determined that I didn’t have Exchange 2010 SP1 I went and downloaded it went through the update process. Once I completed the update I was able to use the Set-RemoteDomain command with the –UseSimpleDisplayName parameter. The Get-RemoteDomain pipes all remote domains to the Set-RemoteDomain command so that all outbound messages will use the Simple Display name. You could explicitly define which external domains will see the Simple Display name and which will see the Display Name. It’s probably a lot easier to implement and manage if you just go ahead and apply the change to all external emails. To test that it’s working I updated the properties on my mail box to define a Simple Display name of; Kennedy, Steven. My Display Name being set to Kennedy, Steven (SJWK). As you can see from the following screen shots it works fine. The first screen shot is of the email as seen by an Internal recipient. As indicated by the red arrows the internal user see the Display Name. In this case with a (SJWK) appended to the display name. The second screen shot shows the same email but as seen by an external recipient, my Gmail account. In this case it’s had a disclaimer notice prepended to it but as indicated the Internal users show up with their Simple Display name showing. Adding a Simple Display name on my home system was pretty easy. I only have a few accounts and it was pretty easy to update. In a business however you’ll need a process, or preferably an automated way, to generate the Simple Display name. You’ll also need some sort of governance model around it. You probably don’t want users pestering IT to set either or both of the display names to what they want. You should also be aware that if an internal user Forwards or Reply’s to an email (Reply or Reply All) then the message body will show the internal Display Names. The point being that you cannot depend on the use of the Simple Display name to ‘hide’ whatever you’re using for an Display Name. However, external recipients will only see various address fields of the email; From, To, CC, Bcc etc..
Part of my home network includes an an Exchange 2010 server, that I use to look at the features & functions of Exchange. However, when trying to send email from home it’s a bit hit or miss as to whether it’s received at the other end. This is largely due to the other email systems not liking the IP address from which my email is sent, it’s a Verizon TCP/IP address. Seems a lot of the address Verizon uses for home are on various Black Lists. So, I signed up for DynDNS’s Send mail capability, called Sendlabs SMTP. This allows be to send email via DynDNS. The recipients email system therefore sees the source as DynDNS so as long as DynDNS isn’t Black Listed I’m okay. As there is also the possibility that my Internet provider, Verizon FIOS, could decide to block outbound traffic on port 25 I setup Sendlabs SMTP to use an alternate port. The thing to remember is to set the outbound SMTP connector in Exchange to that alternate port, which I didn’t remember to do. I’d an issue with my outbound email and as part of the fix I had to re-do my Edge Synchronization which entailed re-creating both the Inbound and outbound connectors. Note! because I’m using Edge Synchronization all of the configuration for the send and receive connectors is done on the Hub Transport server, NOT the Edge Transport server. 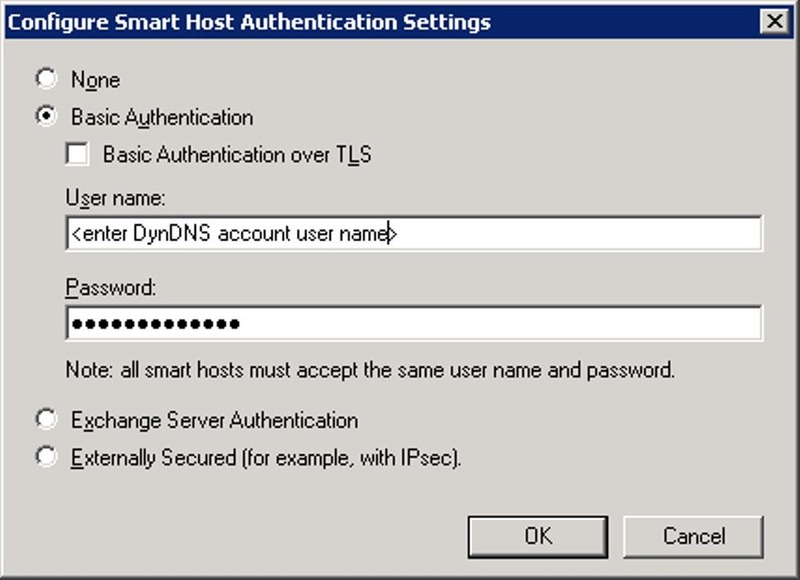 DynDNS have the steps for configuring the outbound connector using both the Exchange Management Console (EMC) and the Exchange Management shell. 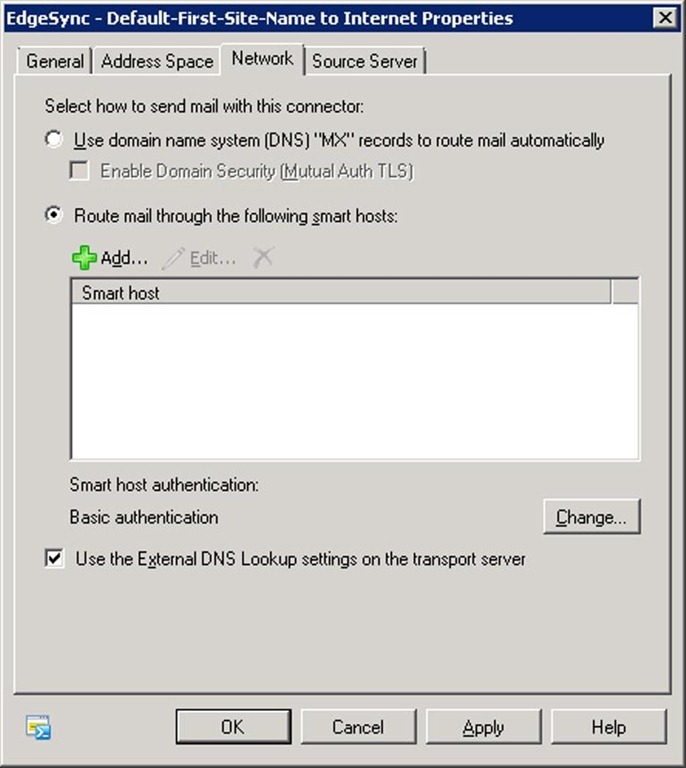 As my send connector already existed, it’s created automatically when using Edge Subscription, I only had to update the send connector to point to DynDNS’s mail hop URL and provide the appropriate credentials. You’ll be taken back to Network tab, as shown above. Now click on the Change button. In the subsequent dialog box select Basic Authentication AND Basic Authentication over TLS (not shown in picture). Then enter your DynDNS user name and password. Click on OK to complete the configuration. I have a Microsoft Exchange server at home that I use to familiarize myself with the various features and functions of Microsoft Exchange. I recently used this system to look at the Exchange MailTips functionality. This included the MailTip on Oversized Messages. To investigate this particular MailTip I set message limitations on specific mailboxes for both sending and receiving as well as setting a message size limitation at the Organization level. The post on Oversized Messages shows screen shots of each of these MailTips. Note that this is not a MailTip but an Outlook Popup. This would seem to imply that the Exchange/Outlook configuration has an impact on any additional Accounts that you might have setup on your Outlook client. The resolution to this issue was fairly easy, although I did run in to an ‘issue’. All I had to do was reinstate the Organization message size limitation back to the default of 10MB, from the 10KB that I’d set it to. I did this via the Exchange Management Console. I’ve included a screen shots below. The first is where to set the global Send/Receive message size limitations. The second is the actual Properties dialog box. Having re-set the message size limits I applied the changes and then went back to Outlook to re-try my email, with an attachment greater than 10KB. Unfortunately I still received the popup to the effect that the message was to large. This is the ‘issue’ that I ran in to. I then stopped an re-started Outlook, on the basis that the change I’d made to Exchange hadn’t made its way down to my Outlook client and that by re-starting Outlook I would force the change to take effect, only it didn’t. I still received the popup. I then went back to the Exchange server and re-booted it. yes, this is a brute force approach. It’s entirely possible that I could have just stopped and restarted the appropriate Exchange services. Or, it might be that the change would have take effect if I ‘d just waited, question is how long would I have had to wait. Having re-booted Exchange Outlook still gave me the popup until I’d once again re-started Outlook, after the Exchange re-boot. At which time the restored message size limitations seemed to have taken effect on both Exchange and my Outlook client. That there are various Exchange configuration settings that impact Internet email accounts that you’ve configured in Outlook. In this particular case it does seem a bit od that a message size limitation set on Exchange is impacting an Internet email, POP3, account. One wonders what other Exchange configuration settings get applied to Internet email Accounts in Outlook? I suppose the rational behind applying this particular configuration setting could be that if a company has imposed message size limitations on their internal email system then why shouldn’t they be applied to any other email system that’s using the companies infrastructure. One wonders though what happens when the user is not connected to the company network, that is they’re at home, on the road. Does the limitations still apply. Guess I’ll have to look in to this one. With Custom MailTips you can use HTML codes, well the <A href=> code, as part of the MailTip. However, I’ve only been able to see the HTML work when using Outlook Web Access (OWA). As you can see from the two screen shots below OWA displays the correct HTML but the Outlook client doesn’t. This would seem to be a fairly useless MailTip capability as the OWA version of the MailTip would behave differently than the Outlook version. Seems that the only time when this capability would be of any real use would be in an environment where only OWA is used, or where you know that the Custom MailTip will only apply to OWA users. In this later case instead of opening the targeted help desk web site an email will be opened with the email address pre-populated. The Restricted Recipient MailTip is displayed if the sender adds a recipient for which delivery restrictions are configured prohibiting this sender from sending messages. The MailTip indicates the recipient to which the sender isn’t allowed to send messages and gives the sender the option to remove the recipient from the message. It also clearly informs the sender that the message won’t be delivered if sent. The screen shot below shows the actual MailTip wording that you’ll see, for an Internal recipient. 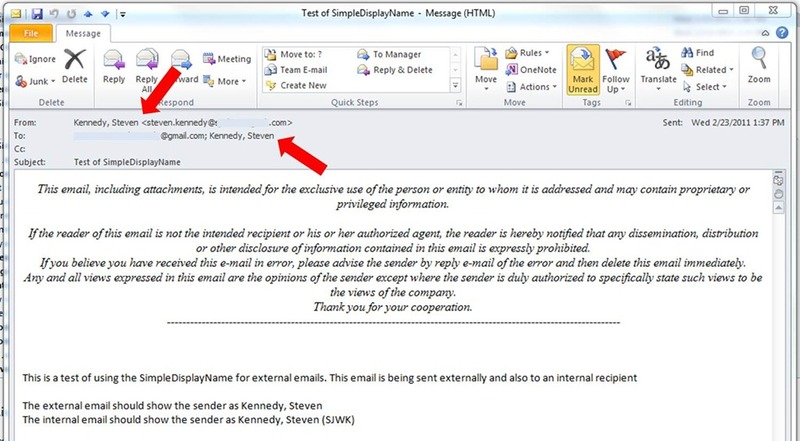 The screen shot below shows the same wording for the MailTip in the case of a restricted External Recipient. In this case the External Recipient MailTip is also turned on so you get both the Restricted Recipient MailTip and the External Recipient MailTip.